Caldwell Restaurant Week will return August 9th to 16th 2015 following the success of the first event in 2014. Most of the borough’s restaurants joined the fun with special prix-fixe menus that showcased the culinary diversity of this West Essex community. Caldwell’s restaurant and food scene has been a well guarded secret in the Garden State but one California ex-pat looked to change all of that. The event was the brainchild of culinary enthusiast John Lee. He, along with Carmen Mendez of Xunta Tapas Espana inspired the community to do something that even local bloggers said could not be done: Caldwell Restaurant Week. Lee explained that the idea for Caldwell Restaurant Week came about while dining at Xunta-Tapas Espana. It was a snowy day and “none of the locals” as John calls them, “were out on the road, except for us Californians.” With few people in the restaurant, Xunta owner Carmen Mendez chatted with John whose “why not” attitude is infectious. One thing led to another and Caldwell’s first restaurant week was created. The idea of a summer restaurant week sounds a bit contrary because “everyone goes on vacation in the summer” but how many of know anyone who summers for the entire season? Understanding that most of people in the the community, and surrounding communities, are in town, yet very few special events are planned, it seems like the perfect chance to take. With longer days making evening strolls before and after dinner possible and following Bloomfield’s lead of a summer restaurant week, August made perfect sense. Lee was also actively involved in Bloomfield’s successful restaurant week which took place a week earlier. Caldwell’s First Restaurant Week was and an undeniable success!! We are so thrilled!! We want to thank all that participated with enthusiasm but most of all to those that believed that it could be done. Thank you for the tireless support and more than anything encouragement!! John Lee you are inspiration…literally!! The Caldwell Merchants Association sponsored all of our signs and were pivotal in getting the word out….Thank You, Thank You. Our Mayor Ann Dassing for your encouragement and support of the event. Thanks to all that lent a hand but most of all, a kind word. Lastly but most importantly Thank You to all of our wonderful customers who came out to support Restaurant week…new and old….you are the reason it was such a success!! If you missed it, don’t wait until next time, discover Caldwell’s dining scene today. 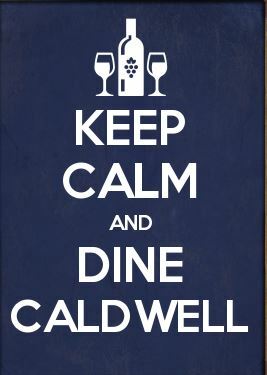 And be sure to visit Caldwell Restaurant Week on Facebook and follow them on twitter at @CaldwellNJRW so you can get the most out of the hottest summer food event this August!